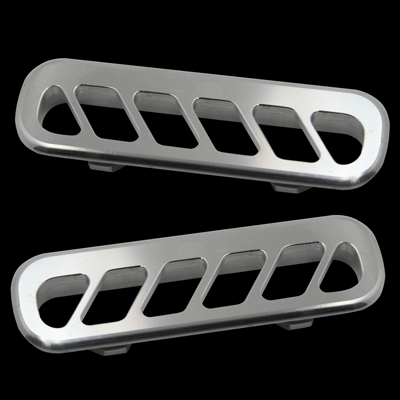 Replace the boring plastic vent in the top of your door panel with this pair of Billet Door Vents from UPR Products for your 2010-2013 Ford Mustang V6 or V8. These vents replace the factory vents that simply pop out with a flat head screwdriver and the new vents snap into place. CNC Machined from 6061 Billet Aluminum for a perfect fit including the Diamond cutter final pass giving it the best finish possible. Installs in 15 minutes or less. No hardware required for install just snaps in place of the factory vent. 2010 2011 2012 2013 Mustang V6 GT GT500 Boss 302 Saleen Shelby Steeda & Roush Mustangs. No one else can stack up to the bold clean styling of our aftermarket Billet dress ups, Street Strip & Racing Suspension & Performance Parts for your late model American Muscle Car!